2019: City of Summerville, Public Works Public Works Department, will have East Washington Street from Hwy 27 to Economy Street closed. 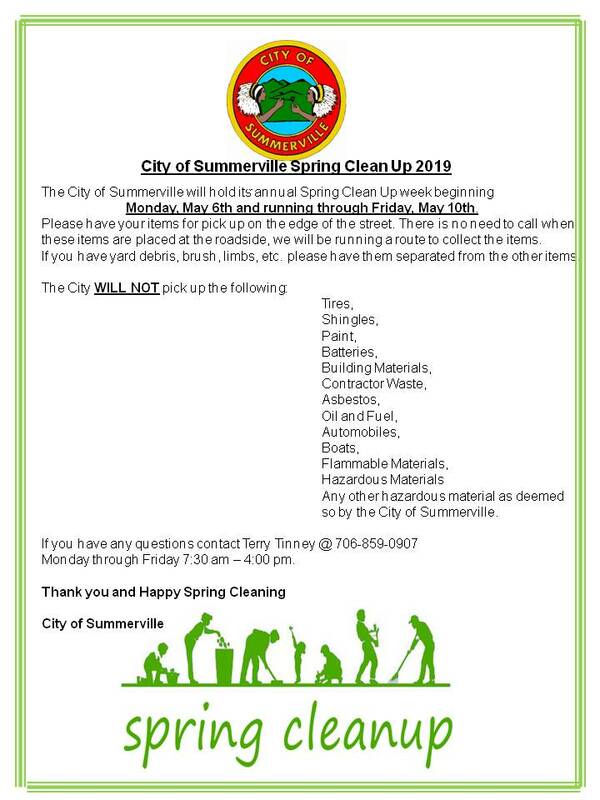 City of Summerville gives you access to your account 24 hours a day, 365 days a year. It's a convenient way to pay your bills on time--with no waiting! Save postage by paying your bill by phone. Access your updated account instantly. Hear real-time balances, payment amounts, and due dates. Enter your information securely through an automated system. Call 1-833-250-4484 to make your payment over the phone! DCA is requesting that Grant Recipients and Applicants review the DCA Analysis of Impediments or Assessment of Fair Housing. Summerville was founded in 1848 and is the county seat of Chattooga County. It is home to 4,534 people who exhibit warmth, friendliness and helpfulness to their neighbors and visitors. Experience this yourself by attending our local festivals, park activities, our annual holiday celebrations and services offered in our religious institutions.